Running numbers: 4101 - 4120, later renumbered 4149 - 4168. Built: 1908 (4149 - 4168) to lot number 176. The 'Flower' class of locomotives were very similar to the 'Atbara' class of engines except that the framing was of the deep straight frame design. In addition, the taper version of the Standard number 2 boiler was utilised together with screw reverse and copper capped chimneys but without superheating or top feed. The fitting of superheaters began in 1910 with top feed being added one year later. The same strengthening of the frames around the trailing axleboxes as the 'Atbaras' was performed in 1910. 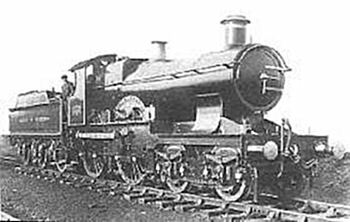 As with all GWR locomotives, the class was renumbered in December 1912 to the 4149 - 4168 series. With conditions similar to the 'Atbara' class, three engines began the withdrawal of the class in July 1927, these being numbers 4153 Camellia, 4160 Carnation and 4165 Narcissus. The last locomotive of the class survived until April 1931, number 4150 Begonia. Specifications (long cone boiler with superheater).